Is it weird that I can watch Trauma:Life in the ER on the Discovery Channel while stuffing my face daintily eating my dinner/breakfast? 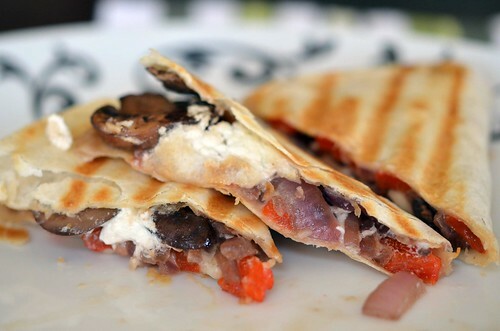 Not just any quesadilla though…this one was stuffed with mushrooms, red onion, roasted red pepper, and goat cheese. I have been stuck in a mushroom and onion state of mind lately. It has been delicious! 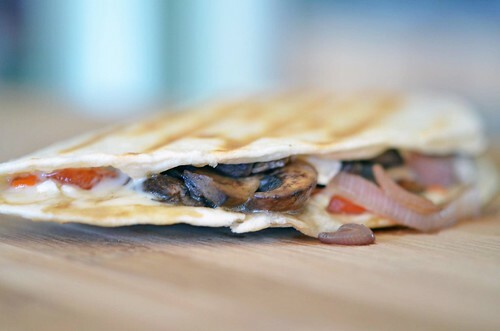 And you haven’t lived until you have tried the trio of goat cheese, mushrooms and onions…wowza! I tried making these with a healther whole wheat version of a tortilla…though good, it didn’t have the texture I was hoping for. It never got exactly crispy/flaky like a quesadilla should be. Also, I used my George Forman fat grilling machine to make mine…it provided a nonstick surface, no flipping required, and well all my skillets were dirty…. Butter one side of the tortilla…the side that will go face down on the hot surface. Prepare vegetables. Preheat broiler, and place red bell pepper on a sheet pan and place under the boiler. Broil until skin blackens, turning every so often. About 10 minutes or so. Once sufficiently blackened, remove from oven and let cool (cool enough to handle). Remove skin and cut into thin slices. 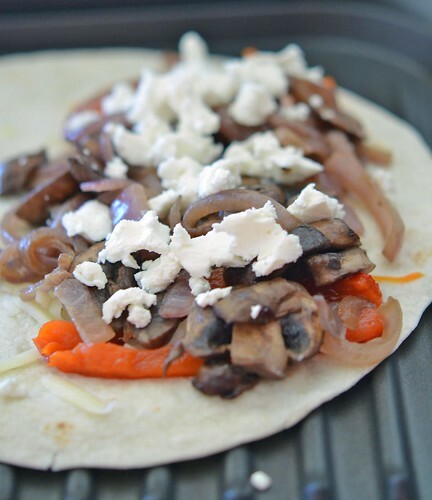 In a medium skillet over medium – high heat, place 1 Tablespoon butter, mushrooms, and red onion. Cook until tender and slightly browned, stirring occasionally. About 10 minutes. 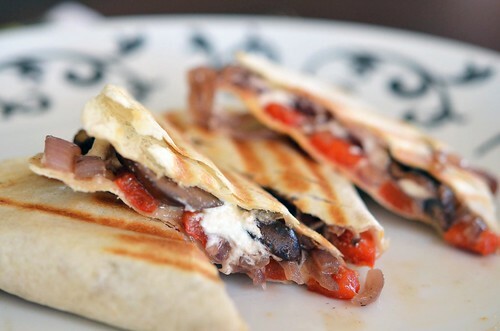 Assemble quesadillas. 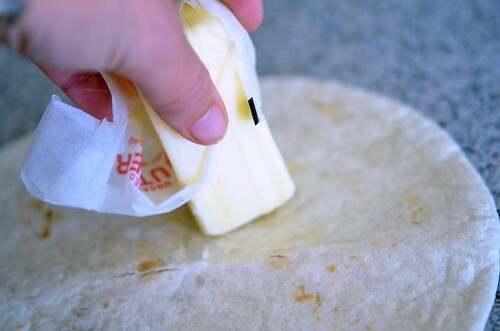 Lightly butter one side of tortilla. 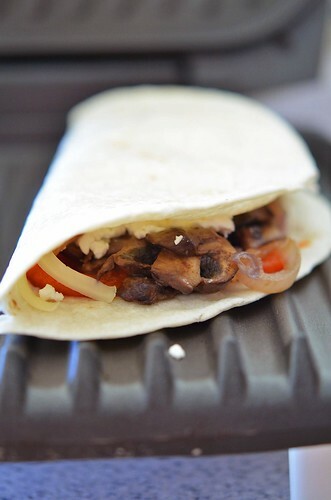 Place buttered side down and on one half of tortilla sprinkle monteray jack cheese, roasted red bell peppers slices, and mushrooms and onions. Dot evenly with goat cheese. 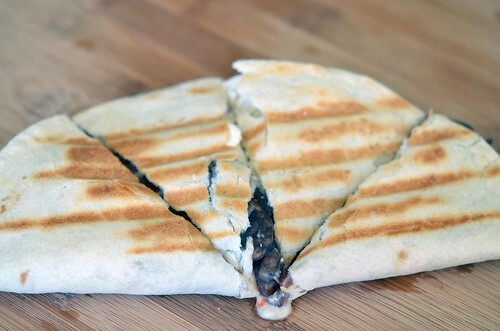 Fold tortilla in half and place in skillet/George Forman Grill and grill until browned on both sides. Just a few minutes. 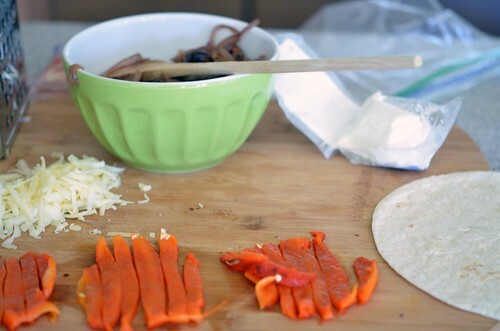 Remove from heat source and with sharp knife or pizza cutter, cut into wedges. Enjoy! 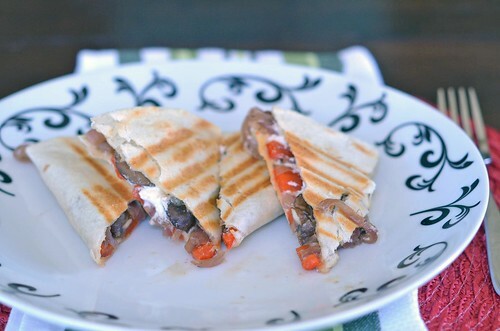 Tips: The filling for these quesadillas can be increased or decreased to feed any quantity of people. Do not stuff these too full, stuff falls out!